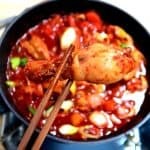 Home » BBQ & Meats » Dakdoritang – Spicy Chicken Stew! 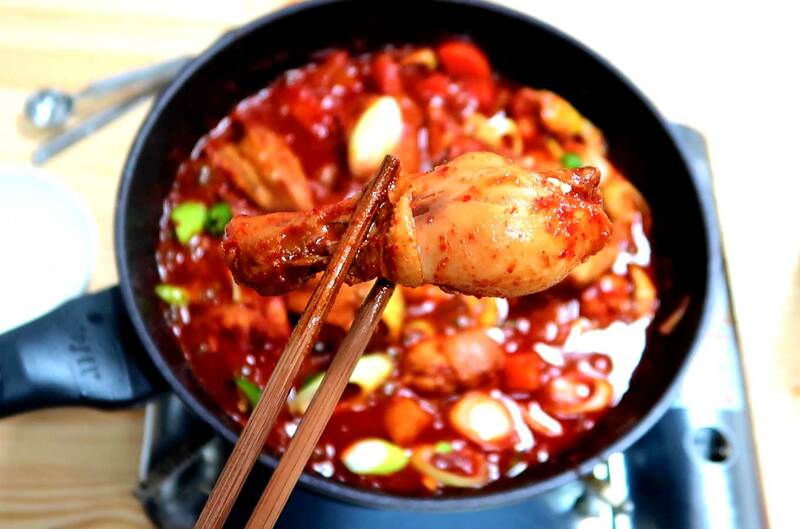 Dakdoritang is a special chicken dish to cook at home when you are craving something spicy! It is chicken that is boiled in a spicy red chili sauce along with potatoes, carrots and other vegetables (similar to Indian curry). As the chicken cooks and reduces, the chili sauce is infused with the rich oils of the chicken and a spicy kick from the Korean chilis. 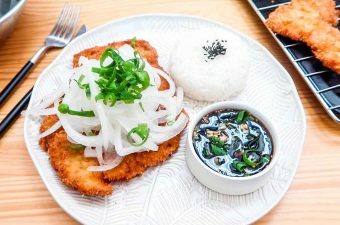 The result is a spicy and tangy chicken that will have your mouth craving for more after each bite. But don’t forget about the chili sauce! The sauce may look like it erupted from Mt. Hallasan but this is where the real umami lies. 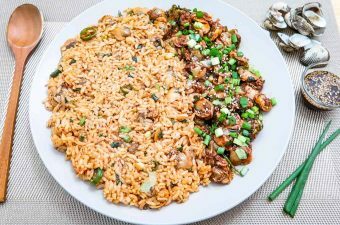 After a bite of the juicy chicken, pour a spoonful of this red marinade (as well as piece of a vegetable) over your hot sticky rice and take another bite! 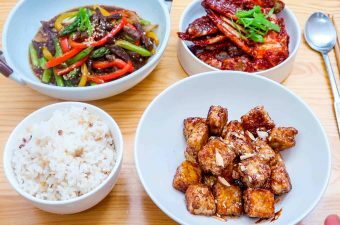 Whenever I eat this dish, I find myself filling up on a second bowl of rice! 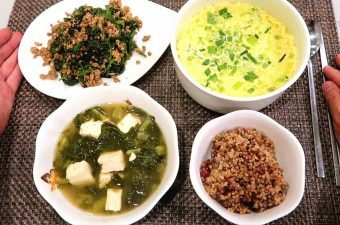 Cooking tips: In the video, I used 1/3 cup of Korean red chili flakes. I would recommend using 1/4 cup and adding more later – if needed. A special dish which combines the power of Korean red chili flakes and chicken. Spicy, tasty and addictive. Make sure to pair with a bowl of rice. Slice up a whole chicken into smaller pieces (or buy pre-cut). Take out a large mixing bowl and place the chicken in it. While you wait, dice-up the potatoes, onions and carrots into small pieces. Slice spring onions into circles for garnish. Drain the chicken and give it a rinse under cold water. Then place in large pot (or a large frying pan). Fill the large pot with two cups of water. Then add sugar to the water. Place pot on medium-heat and bring it up to a boil. Skim off the impurities that surface to the top of the broth. When chickens are cooked about half-way through, add-in the vegetables. Let the vegetables boil - until the potatoes turn soft. When potatoes are soft, add garlic, soy sauce and Korean red chili flakes. Use a soup ladle and gently mix-in the three seasonings into the soup for about 1 minute. Turn off the heat and add sprinkle spring onions on top for garnish. Eat the dish with some hot sticky rice! If the sauce reduces too quickly while boiling, simply add a bit of water. Just want to say, Daniel and Katie, you changed our lives! 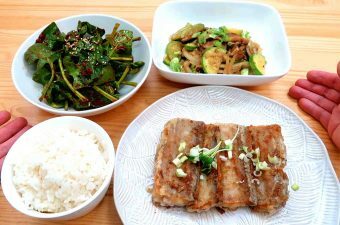 My hubby has always been a picky eater, he doesn’t like vegetables and never liked spice…until I discovered Korean food! I found KBS World and then I found you on Youtube, I will admit I edit the chili sometimes (after all, he’s 73!) but he loves every one of your recipes I’ve cooked. Even ones I thought didn’t come out right! Kam sam nidah! !